Tahini Market Segmented By Product Type - Paste & Spreads, Desserts & Other Sweets, Sauces & Dips; By Distribution Channel - Modern Retail, Conventional Retail, Exports, HORECA; Product Size - Below 50 Grams - 50 – 150 Grams, Above 150 Grams; Production Process - Industrial Process, Conventional Process. Persistence Market Research presents an all-inclusive study of the global tahini market titled ‘Global Market Study on Tahini: Paste and Spreads Product Type Segment Projected to Remain the Largest Segment During the Forecast Period?’. This study demonstrates the market dynamics and trends globally which influence the current nature and future status of the tahini market over the forecast period. In this report, Persistence Market Research gives an overall view of the global tahini market and also throws light on the market sentiment and overall segments of this market. The period of assessment of this report is for 10 years and this report enlightens the clients on the crucial aspects of the global tahini market in the coming decade. An in-depth study of the market was done by the highly qualified team of analysts of Persistence Market Research and information was collated on the drivers and trends that will influence the market in the coming decade. The report gives a detailed description of the effect these drivers and restraints will have on the global tahini market and this gives a crystal clear picture to the client regarding how the market will shape up in the future. The report also offers updates on value forecasts and opportunities for manufacturers operating in the global tahini market. A section of the report discusses how the overall competition in the global tahini market is steadily increasing. It discusses various factors shaping the internal as well as external competition in the market. Overall internal competition in the global tahini market is observed to be comparatively high owing to a large number of providers of tahini and increasing number of small domestic players in the market. The global tahini market is facing external competition from producers and distributors of raw materials and other food processors, which are adopting forward and backward integration strategies, and developing their own facilities to produce tahini paste. Various barriers to entry in the industry are analyzed and rated on the basis of their impact on the competition levels in the market. Persistence Market Research analyzes the market share of tahini on the basis of product type, distribution channel, product size, production process, and region. A section of the report highlights tahini demand, region-wise. It provides a market outlook for 2015–2025 and sets the forecast within the context of the tahini ecosystem, including strategic developments, latest regulations, and new product offerings in the global tahini market. This study discusses key trends contributing to the growth of the global tahini market and analyzes the degree to which drivers are influencing the market in the various regions assessed. In the final section of the report, a competitive landscape has been included to provide report audiences with a dashboard view of the competition in the global tahini market. Key categories of providers covered in the report are tahini suppliers, manufacturers, and a list of major retailers and raw material suppliers. Detailed profiles of tahini providers are also included in the scope of the report to evaluate their long- and short-term strategies, key offerings, and recent developments in the global tahini market. In order to offer an accurate forecast, we started by sizing the current market, which forms the basis of how the global tahini market will grow in the future. Given the characteristics of the market, we have triangulated the outcome of different types of analyses, based on the technology trends. Top-down approach has been used to assess market numbers for each product category. Bottom-up approach has been used to validate numbers reached and the market numbers for end use applications. Macro-economic indicators such as GDP, wholesale & retail trade, merchandise trade and prices have been considered to arrive at indicated market numbers. In addition, it is imperative to note that in an ever-fluctuating global economy, we not only conduct forecasts in terms of CAGR, but also analyze the market on the basis of key parameters such as year-on-year (Y-o-Y) growth to understand the predictability of the market and to identify the right opportunities across the market. Further, all market segments are analyzed in terms of basis point share to understand individual segments’ relative contribution to market growth. This detailed level of information is important to identify various key trends governing the global tahini market. Also, another key feature of this report is the analysis of all key segments in terms of absolute dollar opportunity. This is traditionally overlooked while forecasting the market. However, absolute dollar opportunity is critical in assessing the level of opportunity that a provider can look to achieve, as well as to identify potential resources from a sales and delivery perspective in the global tahini market. Finally, we know the importance of dissecting the different market segments in terms of their growth and performance in the global tahini market, and towards this end, we have developed a market attractiveness index to help market players identify current and future market opportunities. In terms of value, the global tahini market is estimated to exhibit a CAGR of 5.2% during the forecast period (2015–2025). The global tahini market accounted for a market value of US$ 1,300.1 Mn in 2014 and is expected to reach US$ 2,258.3 Mn by the end of 2025. On the basis of product type, the paste and spreads segment is projected to account for the largest value during the projected period. 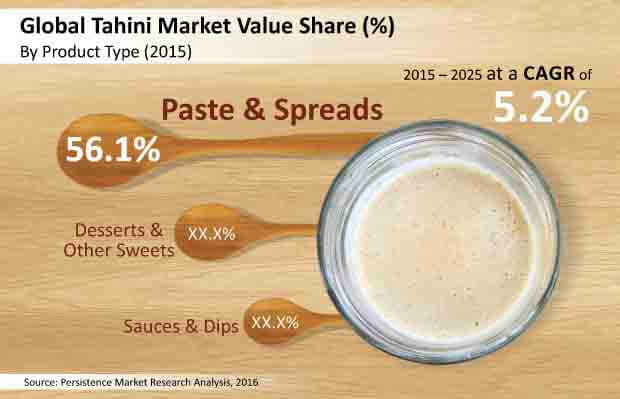 In 2015, the paste and spreads segment accounted for over 55% value share of the global tahini market, while the desserts and other sweets segment accounted for around 25% value share of the global tahini market. Rising preference for Middle Eastern flavors in pastes and spreads coupled with the growing demand for hummus and other tahini based products is expected to support the consumption of pastes and spreads in the coming decade. Paste and spreads segment is projected to reflect steady growth; whereas sauces and dips segment is likely to show slight increase post 2022, owing to increasing demand for Middle Eastern flavors in North America and Southern Europe. Tahini spread segment in the global tahini market was valued at nearly US$ 470 Mn in 2014 and is projected to reach over US$ 775 Mn by the end of 2025 owing to increasing usage of tahini paste in bakery products. In terms of revenue, the other sweets sub segment is forecast to grow 1.6X by 2025 compared to that in 2015. This segment is expected to create incremental opportunity of over US$ 80 Mn between 2014 and 2025. National Confectionery & Tahina Factory Co. Ltd.